BARRELASSIN': THIS COUNTRY NEEDS A MINDFREAK! NOT A GOVERNMENT SHITDOWN! THIS COUNTRY NEEDS A MINDFREAK! NOT A GOVERNMENT SHITDOWN! Apparently Katie Couric, Criss Angel, and LL Cool J are not at the forefront of The President's mind today. I've been waiting to see this episode and was so excited to watch it, and found that their faces resemble Barrack Obama's a lot. They looked just like him talking about the Government Shitdown, I mean shutdown! It was remarkable! I know these topics are important for our country, but what I don't understand is, why he only seems to discuss them when I want to watch something? 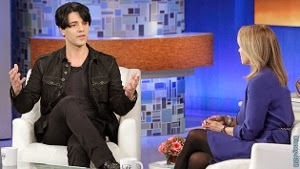 Maybe that never happened and it was all a total mindfreak Criss Angel pulled out of his hat. Either way- I missed almost all of LL Cool J's appearance and I'm a little moody due to such acts by the "Breaking News" that basically only told me what I already know. Nobody is working together and everyone in America is paying for it while Congress has it's little feud. Maybe LL Cool J could "knock them out." Maybe Criss Angel could work a little magic on them or at least give Congress the "illusion" that we are just as important as they are. What we need in this country, is a little more Criss Angel and LL Cool J. Thanks, Katie Couric- you tried.